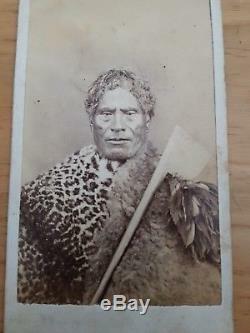 Mid 1860's Original Photograph of Maori Chief Holding a battle axe. Size approx 4 inches by 2.5 inches. The item "Maori Chief Rare 1860s antique album photo NEW ZEALAND photo ORIGINAL" is in sale since Sunday, June 24, 2018. 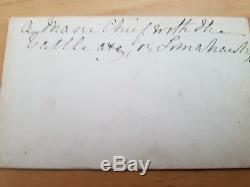 This item is in the category "Collectables\Photographic Images\Antique (Pre-1940)\CDV/ Cabinet". The seller is "shipper99" and is located in alness, Highland. This item can be shipped to United Kingdom, Austria, Belgium, Bulgaria, Croatia, Cyprus, Czech republic, Denmark, Estonia, Finland, France, Germany, Greece, Hungary, Ireland, Italy, Latvia, Lithuania, Luxembourg, Malta, Netherlands, Poland, Portugal, Romania, Slovakia, Slovenia, Spain, Sweden, Australia, United States, Canada, Brazil, Japan, New Zealand, China, Israel, Hong Kong, Norway, Indonesia, Malaysia, Mexico, Singapore, South Korea, Switzerland, Thailand, Saudi arabia, South africa, United arab emirates, Chile.